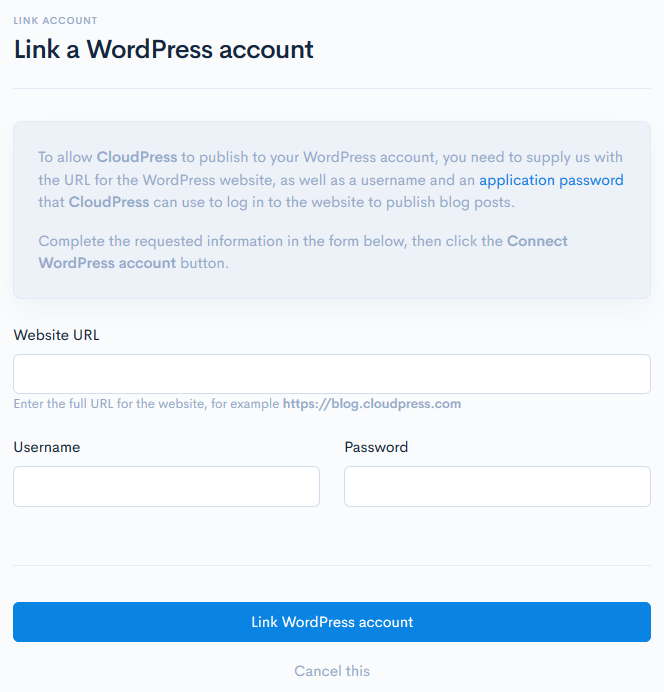 To link your WordPress account to Cloudpress, you will need to supply Cloudpress with the URL (or address) of your WordPress website, as well as a username and password Cloudpress can use to connect to your WordPress website. The WordPress user account you use when linking Cloudpress to your WordPress website must have the ability to create posts on your WordPress account and therefore either have the Author or the Editor role. You can follow the official WordPress documentation to create a new user. Cloudpress requires you to make use of the Application Passwords Plugin. This plugin will allow you to create application-specific passwords for users and use that for authenticating the user, rather than the user’s actual password. You can install the plugin by following the link above. Once you have installed the plugin, open the user’s profile page in the WordPress administration area and scroll down to the Application Passwords section. Enter a name for the application password, for example Cloudpress, then click on the Add New button. A popup dialog will be displayed with the application password. Save this password as you will require it in the following step when you link your WordPress account to Cloudpress. 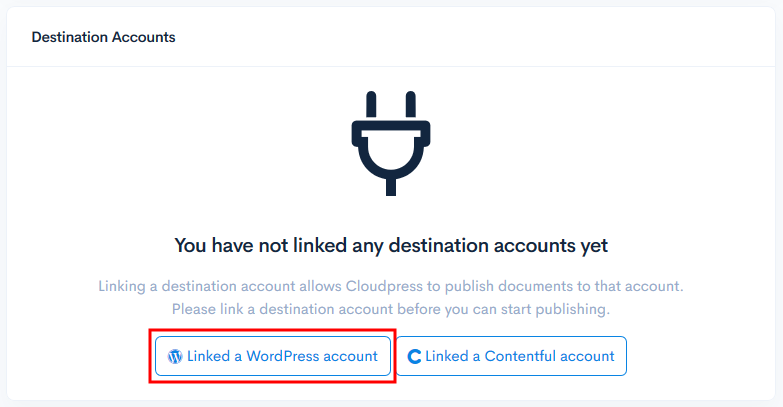 Once you have created a user in WordPress you can link your WordPress account by going to the Destination Accounts section of the Linked Accounts page in the Cloudpress Dashboard. Depending on whether you have previously linked other destination accounts, you will either see an empty account list or a list of the accounts that your have already linked. The Website URL is the URL (or address) for your WordPress website. For example, if your WordPress website is located at https://www.traveldiaries.com, then this is the address that you will fill in this field. 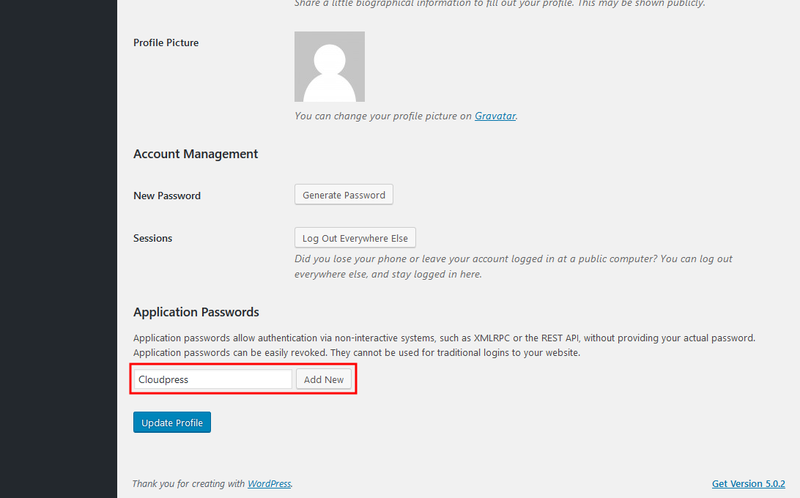 The Username is the username for the user which you created in the WordPress administration area in the previous step. The Password is the Application Password created in the previous step. Once you have completed all of the details, you can click on the Link WordPress account button to link your WordPress account to Cloudpress.